It was one of those moments that occur to the (semi) conscious mind at 430am. Dark blue hues were giving way to light, inch by inch. A lone bird chirped, for it too was an early riser. The sun will reveal itself in the barest of moments. Sunrise in Shanghai. The endless opportunities to discover if one was courageous enough to swing out of bed. Even the cab driver was barely awake during the journey. The hum of the engine served as a monotonous soundtrack as the cit swept by, empty and dead. I hopped off by the newly constructed Bund, which only weeks ago, had thousands of people thronging and jostling on the pedestrian walkway. I hated crowds. Thus, 5am seemed like the perfect time to start my morning affair with the city. Standing by the river, I watched the wind whip the clouds playfully as they gathered and rolled. The sun gained strength as it grew higher, its bold rays streaking across the skyline. I’ve never seen Shanghai like this before. It was as if the Bund belonged only to me, … and a few others. The average age was 50 and above. Retired kite-flyers, joggers and the occasional lone photographer peppered the Bund. The enduring landmark was being enjoyed by its residents, as it rightfully should. It was about 7am when a large group of elderly folk began their morning excerise. The peaceful strains of qigong jarred unharmoniously with a nearby blairing radio entertaining some cha-cha dancers. Just as the tourists started arriving. it was time to leave. I walked toward the city as it opened up and swallowed me back into the noise and bustle. It was a most random yet lovely sight. Spread out over a large field, with tall incinerators serving as a backdrop and passing ships along the Huangpu River (黄浦江) blaring horns in the near distance, a smattering of retired and middle-aged men were flying kites with very interesting paraphernalia. Chatting with them, I discovered that a core group flew kites every day in the field, barring rain or the absence of wind. They also belong to a special club focused on kite-flying and would even conduct demonstations for their former work units (单位). The “leader” of the pack, they teased, was Mr (or Master) Li. Incredibly dapper in a red sweater and a smart tie, he showed me his favored eagle kite. I watched him lay it on the ground and gradually swing the contraption in a circular fashion until the eagle was high enough to soar unencumbered. No forced yanking. Only graceful light steps forward and back to maneuver in accordance to the winds and your own fancy. It takes a certain skill to fly these kinds of eagle kites, Mr Li boasted and the rest nodded in agreement. You don’t see many people flying these kinds of kites in public parks or the city centers they lack the space.. and skill. “You could train non-stop for 3 months and you might maybe master the basics,” he said while inspecting his prized paper aves. Each gentleman has several models to practice, and most craft the kites themselves with patient precision and after many rounds of testing. Many of the men had several stashed in their nifty kit boxes affixed to the back or the front of their bicycles. After a half hour, three men heaved up from their foldable chairs and packed up their tea and gear. As they wheeled their bicycles across the field, they waved and yelled, “See you all tomorrow!” and added, ” Depending on the weather!.” Hopping on, they bicycled off in a neat row. Shanghai is a dense enough city that getting around can be quite a breeze. The city has an ever expanding metro system which carries 3 million people each day, we’re up to 10 subway lines now and it is estimated to be double the size of London’s tube system by 2020. Cabs are relatively easy to flag down on the streets and if you’re lucky, you’d spot one of the new shiny Expo Volkswagon or Buick cabs that actually have seatbelts that work. But there are also tens of thousands of people on two wheels zipping by the street while you are sitting in traffic, which seems to have worsened over the years. The mobility can be liberating. I’ve been eyeing a moped (MOtor+PEDals) for a while but may settle for an electric bike. The former seems unwieldy, and the latter, if stolen, is easier to bear. It’d be perfect to beat the arduous traffic clustering around my office area and head to the nearby wet market for groceries. I regularly cross the Huangpu river by ferry, along with the thousands of day-workers and pay 0.5RMB a trip, 1RMB if you’re on a 2-wheeler. If you’ve never done it before, I heartily recommend it as the view can be amazing. Yes, I’m beginning to like the idea a lot. Stay tuned. This old and rusting ship was moored off the Pudong side of the Huangpu River (黄浦江) by Zhangyang Harbour (张扬码头), but is no longer there. Nobody was ever able to tell me its history except that it belonged to a family in Shanghai that had been looking for investors to restore it. In the few times that I’ve been on board after much cajoling, the interior looked as if it entertained Shanghai’s rich and playful in the 1920s and 30s. (Ed note: A friend – see comments – has wisely corrected me in that the ship was likely borne from the 1980s given that it was welded. Blame my romanticism for such assumptions.) 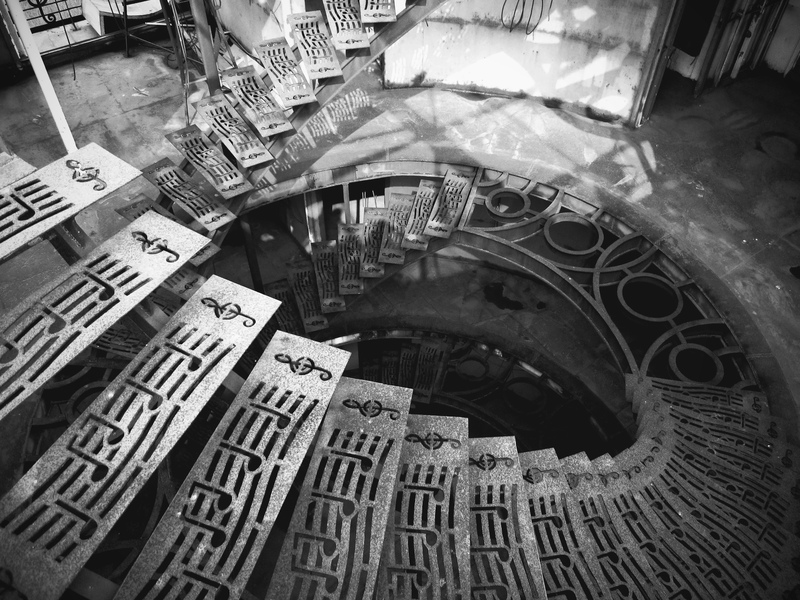 Musical notes were carved into railings, stairs and walls. You could feel ghosts linger in shadowed corners as you walk on rotting floorboards and dodged rusted metal. I doubt many have seen the ship in its full glory. Sometimes, it looked like an abandoned outcast amidst the hustle and bustle of shipping containers and garish tourist boat traffic. Other times, the ship looked like a defiant relic proud of the era it represented, as if it was the only thing that stood between the frantic reality we lived in and the tenuous history we so easily forget. It was an especially iconic sight when the mist comes in after a heavy downpour. 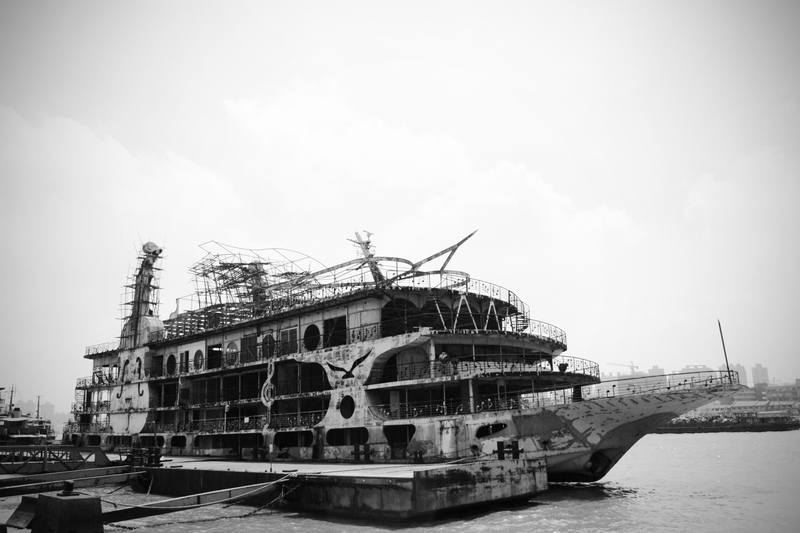 According to a guard who used to live on the ship, it has been towed to Nantong Port (南通港口)in Zhejiang to be restored in time for the Shanghai Expo. Whether it will look as majestic as its former self, or morph into a cliché strobe-lighted circus on water remains to be seen. I was running for the ferry when I came up alongside an old man. He was blind so a kind dockhand helped him on board. As we bobbed across the Huangpu River (黄浦江), the old man sat silently clutching his cane as if listening intently to the small waves lapping at the ferry. However, when we alighted on the other side, the dockhand had to return to work and positioned the old man physically toward his destination. And so I stood there, watching the old man tap his way alone toward a major intersection. Where are you going, Grandpa? I asked him. He cocked his head, a little uncertain of how to react to me. To the bus stop, he said. May I help you, I asked and then lightly gripped his arm. I wonder what he felt when a hand would purposefully hold his arm. Is it instinctive fear or a rush of warmth? He told me he was visiting friends in Pudong (浦东), east of Shanghai, though he rarely left his house. It takes about 2-3 hours for a one-way journey for him which would otherwise take about half hour by car. Just as we approached the stop, I saw his numbered bus pull up. I signaled to the driver to wait up. The sullen looking driver looked right past me and pulled away. Reduced to waiting, I sat the old man down on the bench as he told me about growing up in Shanghai. As his eyesight deteriorated, he missed much of the changes the city had undergone. He told me how proud he was of Shanghai and what a modern city it had become, according to his neighbors. Suddenly, he clamored back on his feet. Best to wait standing, he smiled, the buses don’t always wait for you. Finally, his bus arrived and the old man struggled up the bus steps. I offered to help him all the way home but he didn’t want me to spend money on the fare. All I could remember was the back of the old man, covered in dust from when he sat on the bench. Standing by the side of the road, I suddenly found myself crying. For the lack of kindness you often witnessed in large cities, and for the resilience and optimism that some people held, even if they deserved so much more.